Linoleic Acid Market 2018 « Global Market Insights, Inc.
Touted as a rather niche vertical, linoleic acid market presently stands as one of the most rapidly growing business spheres in the chemical space. One of the foremost factors that has allowed the market to gain such a substantial traction in recent years is the products’ extensive demand in dietary supplements owing to its excellent nutritional value. With global dietary supplement industry slated to reach USD 275 billion by 2024, linoleic acid market demand is sure to upscale, cite analysts. Incidentally, this has created lucrative opportunities for research fellows and core companies that have been extensively working to gather enough substantiations regarding linoleic acid’s nutritional benefits. A recent instance validating the authenticity of the declaration- a study by the researchers of University of Eastern Finland claims that higher linoleic acid level in blood can protect premature death. This essential omega-6 fatty acid also keeps chronic cardiovascular diseases like heart attacks, respiratory issues at bay, cite experts. The linoleic acid level in blood is determined by a person’s diet and its main sources are plant-based spreads, vegetable oils, seeds, and nuts. However, since omega-6 fatty acids also increase production of anti-inflammatory compounds, it is yet to be analyzed how much the dietary quotient is associated with the threat of developing disease. Nonetheless, the extracted fact from the study that higher linoleic acid content can prevent untimely casualties is certain to leave an indeed positive influence on linoleic acid industry expansion over the ensuing years. Undeniably, the food & beverage sector is one of the foremost beneficiaries of linoleic acid market. With the growing consumer appetite for healthy lifestyles and the subsequent change in dietary patterns, omega-6 fatty acid incorporation in modern foods and beverages has increased significantly. As per reliable estimates, global linoleic acid industry share from food & beverage application would exceed USD 1.5 billion by 2024. Regionally, the market penetration is vivid across Europe, driven by the increasing obese population base in countries like Germany and UK. Amidst this backdrop, the European demography has been increasingly spending on nutritional supplements, which in consequence has proliferated regional market trends. Furthermore, sufficient dietary intake recommendations by international food regulatory organizations like EFSA have also resulted in a plethora of product innovation activities in the Europe linoleic acid market. Augmented by France, Italy, UK, and Germany, Europe is estimated to witness a CAGR of 4% over 2018-2024. Asia Pacific belt, having reigned supreme in automotive sector, has lately been emerging as another growth avenue for the market. Over the recent years, inclination toward bio-based materials has been one of the most renowned trends in the paints& coatings industry, subject to its environmental competitiveness over petrochemical derived products. With such premium quality paints and adhesives being widely deployed across APAC’s automotive sector, the regional linoleic is certain to observe meteoric rise over the recent years. As per estimates, overall APAC market would peg a billion-dollar business valuation by 2024, primarily on account of the expanding automotive domain. Not to mention the growing packaging, paints & coatings, construction sectors are also doing their bit to proliferate the APAC linoleic acid industry outlook. Endowed with such a widespread end-use landscape, the market is slated to witness considerable growth over the ensuing years. However, one of the constraints that the business space is facing since ages is the fluctuation in raw materials price trends. Proper sourcing of raw materials, their transportation, and the consistent rally of price fluctuations have hampered the overall profitability to some extent. 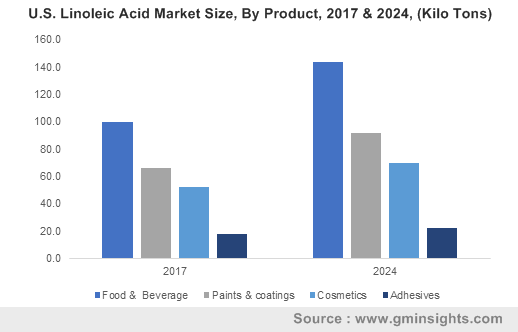 Nonetheless, with improvement in infrastructural capabilities and increased research investments, the financial dynamics of linoleic acid market is expected to recuperate over the coming years. In terms of remunerative portfolio, the overall business space is forecast to exceed a valuation of USD 3.5 billion by 2024. This entry was posted in BIOMASS, BIOENERGY AND RENEWABLE CHEMISTRY and tagged APAC Linoleic Acid Market, Europe Linoleic Acid Market, Linoleic Acid industry, Linoleic Acid industry analysis, Linoleic Acid Market, Linoleic Acid Market 2018, Linoleic Acid Market 2024, Linoleic Acid Market analysis, Linoleic Acid Market forecast, Linoleic Acid Market growth, Linoleic Acid Market report, Linoleic Acid Market share, Linoleic Acid Market size, Linoleic Acid Market trends, U.S. Linoleic Acid Market.